Let's start by calling the anti-gay crackdown in Russia what it looks like to the world, an objectionable modern day pogram. It is time for the international community and the International Olympic Committee to stand up against it before it can metastasize. Two weeks ago a young gay man was murdered in the city of Volgograd. He was beaten, violated with beer bottles, his clothing was set on fire, then his head was crushed with a rock. Then another young gay teenager was tortured on camera by a group of jeering thugs who were acting with obvious impunity. They humiliated, urinated on and beat the fifteen year old boy and posted it online. We don't know what became of him when the camera stopped recording. The thugs who attacked him felt safe enough to post their exploits on Youtube, with each of their delighted faces clearly visible. More gay bashing videos followed. Skinheads with brass knuckles are now appearing outside gay clubs seeking victims. More thugs with fake online dating profiles are jumping the unsuspecting and their crimes are going unpunished. When the LGBT community protest they are arrested. Last month a Dutch film crew traveled to Russia to determine for themselves exactly what was going on. They interviewed several LGBT citizens. Soon they were arrested under Russia's so-called 'gay propaganda' law after they were accused - absurdly - of promoting homosexuality to children. Tourists are now subjected to the same fines and sentences as residents if found in violation of the 'gay propaganda' law. You don't have to be gay to face the fine, you can just speak out in support of gays rights. If you do you can be jailed up to 14 days. This week a daring lone protestor holding a rainbow banner risked his life when he was attacked by a mob of Russian paratroopers. Riot police eventually intervened to prevent them from lynching him. You may be certain he'll be prosecuted for his 'crime' shortly. Russia's new found interest in public morals looks to the rest of the world like a symptom of its moral collapse. LGTB activists happen to be some of Putin's biggest and most vocal critics, so the opportunity to silence them seems to have proved too attractive. Russians may not like gays, they may not like the idea of granting them equal rights, but they shame their own country by changing their laws to encourage the strong to prey on the weak. So far the International Olympic Committee (IOC) has wrung its hands and refused to condemn Russia's anti-gay laws. Instead of putting pressure on President Putin to put an end to the law before it was signed they sat on their hands and hoped that it would all go away. But history teaches us you can't defeat an evil law or the people that it inspires by hoping it will all go away. 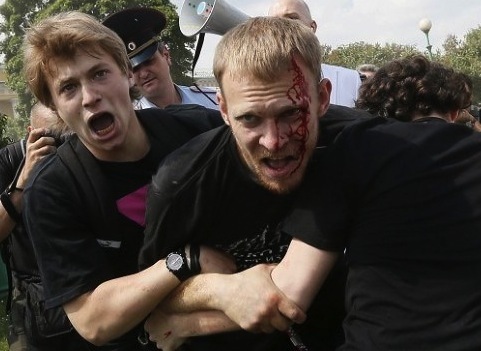 Sadly, Russia's homophobic pogram does damage outside its own borders. It has inspired the very worst people in our own nation, who have slowly started speaking out in favor of the draconian Russian legislation, which does to Russia's LGBT community what the far right can only dream of doing to the LGBT community here at home. We can not do as the IOC have done and pretend that this isn't happening. We can't be Chamberlain's seeking meaningless 'assurances' that our Olympians won't be targeted for speaking out. The situation, thanks to their inaction, has become a complete travesty. Vladimir Putin has failed as a leader, scapegoating gays should not distract Russia or the world from that central fact. But this isn't the first time a Russian leader has embraced darkness and turned his own nation into an international pariah. We must remind him it's always a losing bet. The quickest way to send him that message is to boycott the 2014 Winter Games. Holding these Olympics in Sochi this year under these laws, would be like hosting an Olympic Games in Johannesburg at the height of Apartheid. This draconian law should make us wonder what the second act will be.